I love home canning and have been processing & canning different foods for my family for over 25+ years. Many people think that canning is hard to do, dangerous or just plain expensive when it comes to buying supplies. However...all of that is plain wrong! 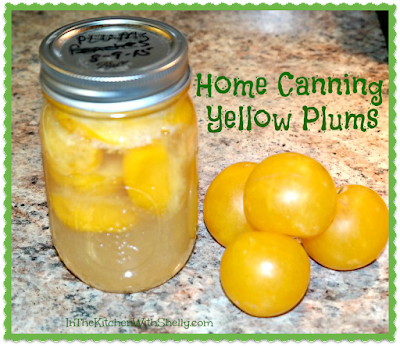 Home Canning is very easy to do, safe when done correctly and almost all of your supplies are reusable from one year to the next! Recently I got a great deal on some fresh yellow plums and decided to preserve them by canning them into pint size jars. The yellow plums that I got were on the small size but absolutely delicious! When I can plums I always follow the recipe & instructions in the Ball Blue Book - Guide to Preserving. In addition, I process them using a light syrup. You will find the recipe and instructions below. * This recipe will yield 6 pint or 3 quart jars. Plus can be canned whole w/the pit in them (must prick skin with sharp skewer so they don't pop during the processing) or slice them in half, leaving the skins on and just remove the pit (which is how I make them). Prep: Wash plums under cold water; drain. Prep the plums for processing (see my notes above). Raw Pack: Prepare syrup (recipe below) for canning in a medium-sized saucepan. Bring mixture to a boil and then reduce heat to a simmer. Fill: Pack plums firmly but without crushing into a hot jar. Ladle hot syrup over the plums to fill up the jar leaving a 1/2" headspace at the top. Remove air bubbles and clean the jar rim. Center lid on the jar and adjust the band until it's finger-tip tight. Place jar on the rack elevated over simmering water in your water bath canner. Continue doing this until all of your jars are filled. Process: Lower the rack into the simmering water. Make sure that the water level covers the top of all jars by at least 1". Lower the rack into the simmering water. Increase heat to medium-high to bring it to a boil. Process pint jars for 20 minutes or quart jars for 25 minutes. Turn off heat and let the jars sit in the hot water for 5 minutes. Remove basket from the canner and place jars on counter to cool. After 12 hours have passed, check all jars to make sure they sealed properly. One of,the reasons I haven't started canning , preserving fruit is that my husband is diabetic and I shouldn't use sugar. Or maybe that is an excuse for me not to bother. I love the plums that are now in season and can be very hard to find in winter.